I’m not really sure why, but J wanted to get out of the house Saturday morning and go down to the Farmers’ Market. It has been a while since we’ve been there on a Saturday morning and I was looking for apricot’s for my grandma to make jam anyway, so why not see if they had them at the Market. Lucky for me, we did actually find a stand with apricot’s, so I took care of that task, but our next task was probably the most important. Lunch. 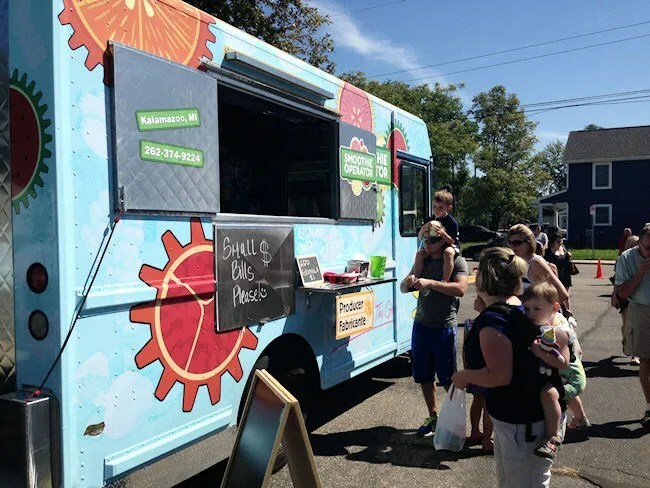 The last couple weeks at Lunch Time Live, J has been disappointed that the smoothie truck wasn’t there. As we were walking along the inside of the market, J spotted the truck she’s been looking for. 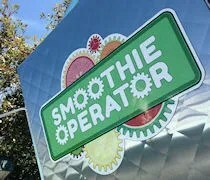 Smoothie Operator is a new truck having been around only since the spring. The only thing on the menu, as the name implies is smoothies. The owners have a family farm in Berrien Springs that specializes in exotic berries, so the next logical step? Smoothies. 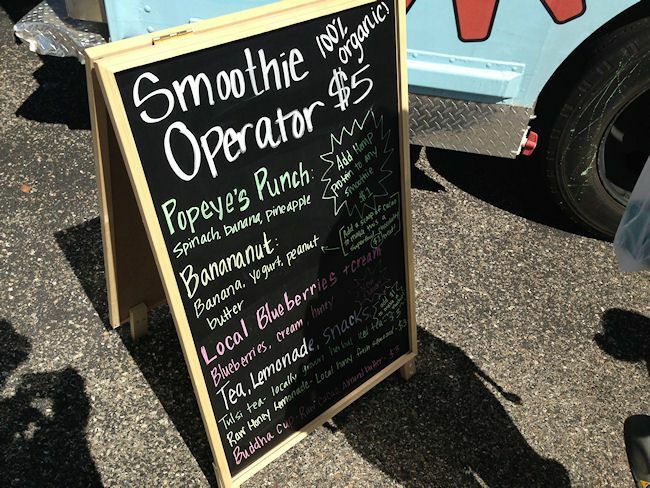 The menu changes constantly and consists of five different smoothies each time the truck is out. J was starting to walk by the truck instead preferring to find something to eat, but she stopped in her tracks once she read the chalkboard in front of the truck. J’s choice was Popeye’s Punch. The smoothie consisted of spinach, banana, and pineapple. The five dollar glass came out of the window a few minutes later with a green concoction that J said tasted a lot like banana and pineapple. 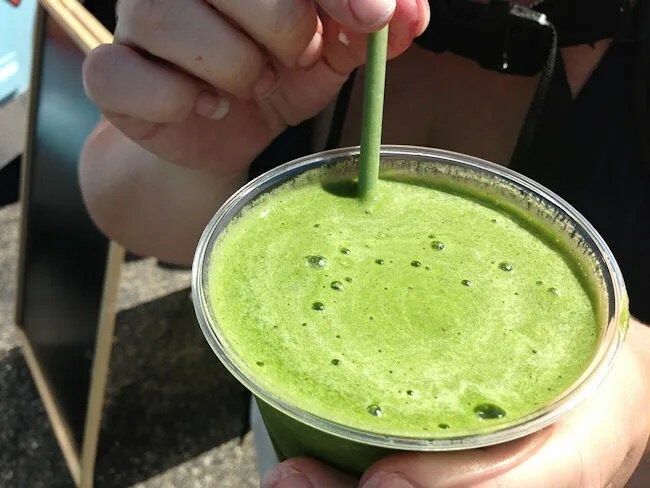 According to her, the spinach really only added the color. If they could find a way to fit a hamburger in to a smoothie, I probably would have drank my lunch as well, but they haven’t yet, so I moved on to tacos. J really liked her smoothie, but it’s not a meal on it’s own, so we ended up having to stop for her to get lunch on the way home. She had been looking for Smoothie Operator for some time now and our impromptu trip to the Farmers’ Market proved to be a good one.